The California Veterinary Medical Board will soon take away the rights of California pet owners to freely choose affordable non-veterinary care for animals. They have already made it illegal to use a chiropractor or animal dentist without a veterinarian paid to be present. Non-anesthesia dentistry for dogs and cats is no longer available except through a vet, and human acupuncturists are under threat to lose their license if they work on animals. Now the Vet Board wants to ban non-vet practitioners of most other complementary and alternative services for animals. California is the last state that has not been completely shut down by the vet boards. But if we don’t act, we will lose our freedoms. The California Veterinary Medical Board will soon take away the rights of California pet owners to freely choose affordable non-veterinary care for animals. 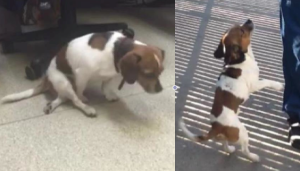 Snoopy was paralyzed and abandoned at a dog park. Two veterinarians advised his rescuer to put him down, saying his chances to walk were slim. Instead she took him to swim therapy, massage and acupuncture. Snoopy is now walking and even jumping like a normal dog. He would not be here today without the help of non vet complementary /alternative animal care practitioners. Act now to preserve your right to choose the kind of animal care you want. Email us through our website if you want to volunteer to help stop these regulations. Letter to Legislators – Please sponsor a bill!